The U.S. job market remains gloomy. Early this month, the government statistics showed that monthly unemployment rate surged to 15-year high last month. Today, the Labor Department says Americans who file for new jobless insurance claims rose 30,000 for the week ending December 20, 2008, to reach 586,000, the highest level since November 1982. The more reliable 4-week moving average also saw a big increase of 13,750 to 558,000. 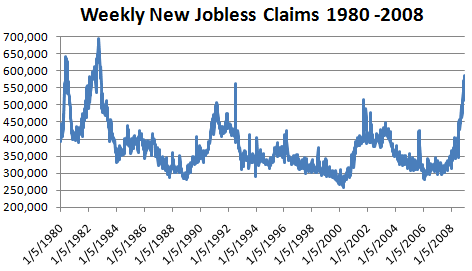 The new jobless claim number added to the fear that the recession, which is one year old already, is worsening. Yesterday, the Commerce Department reported that the U.S. economy shrank by 0.5% in the third quarter while new house sales fell to 17-year low in November (Bloomberg), showing no sign the housing market is bottoming, let alone improving.